“The labor share in Europe has been on a downward trend. This paper finds that the decline is concentrated in manufacture and among low- to mid-skilled workers. The shifting nature of employment away from full-time jobs and a rollback of employment protection, unemployment benefits and unemployment benefits have been the main contributors. Technology and globalization hurt sectors where jobs are routinizable but helped others that require specialized skills. High-skilled professionals gained labor share driven by productivity aided by flexible work environments, while low- and mid-skilled workers lost labor share owing to globalization and the erosion of labor market safety nets. 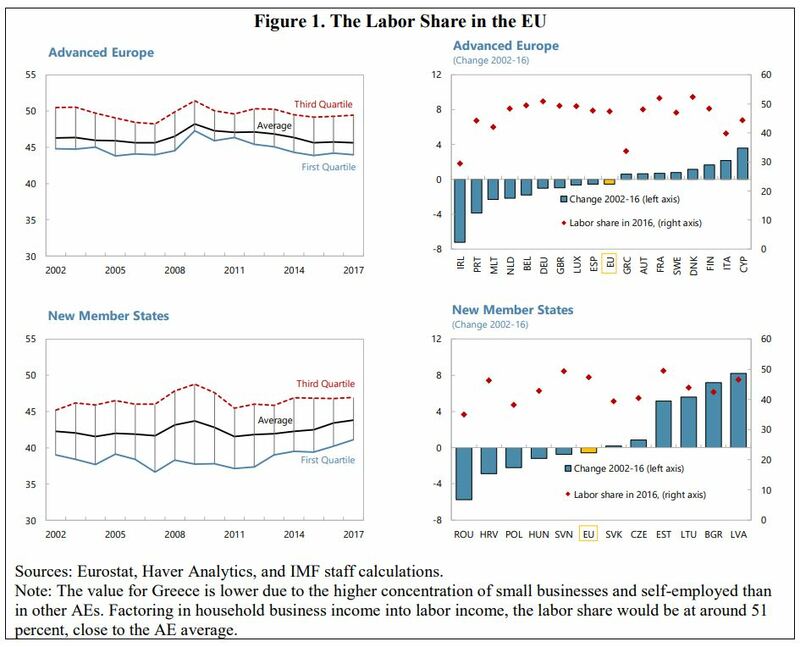 The value-added share accrued to labor commonly known as the labor share—the ratio of labor compensation (wages and benefits) to national income—has been on a downward trend in the EU in the last couple of decades (Figure 1). This trend is observed both in recession-hit Advanced Economies (AE) like Ireland, Portugal and Spain as well as in economically prosperous Germany and the Netherlands (Figure 1, upper panels), and began around 2012–13 after the Great Recession (GR). In New Member States (NMS), Estonia, Hungary, Latvia and Lithuania experienced a decline in 2009–15 and are on the rebound (Figure 1, lower panels). Other NMS economies such as Croatia, Poland and Romania have yet to return to their 2002 levels. The positive exception is Bulgaria whose labor share has been on an upward trend due to an economic deepening from relatively low levels.